I've been thinking about what constructively to write in this post. So it's time to thank Tom & Liz who have agreed to babysit Lucinda's Country Inn from time to time. We really appreciate them doing that. Our guests, the wineries in Fair Play and our friends who have met them all agree - they are fantastic people. Some have even stated, maybe they should replace us, that's how friendly and nice Tom & Liz are. We are working on that. They gave Cindy & I a chance to get away for a two week trip, a river cruise on the Danube from Budapest, Hungary to Bucharest, Romania. WOW, what an experience. The river Danube is beautiful. In a couple of spots it is almost a mile wide and at the Iron Gate Gorge it is just a little over one hundred fifty yards wide. It is blue in some places, especially looking off in the distance. To accommodate large barges transporting many types of goods up and down the river a dam was built that raised the water level about 100 feet in some areas. Yes, they had to move villages and farmers. Now the big barges and river cruise ships can transverse the entire Danube. The start of our trip was in Budapest. We arrived in Buda and spent our first night at the fabulous Ritz Carlton (Thank you Marriott Rewards points.). It is in a large building converted from a communist government operation. They did a great job of converting a utilitarian building into this luxury establishment. 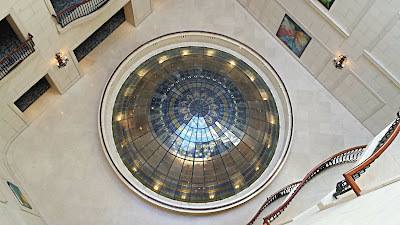 This is from the topside in the skylight shaft of the lobby dome in the Ritz Carlton. I use Buda because at this point in our trip that is where we were. The locals require you to visit the other side of the river, Pest, by crossing the Chain Bridge, before you can say Budapest. You must visit both sides over that bridge to use the full name. We did a hop-on, hop-off bus tour. There were two routes and we took both so we could see and be told about most of Budapest. Budapest, Hungary; Belgrade, Bulgaria and Bucharest, Romania were the three highlights of our trip. When the ship docked at the points of the cruise for a tour of the sites, we boarded buses and were driven to the sites. In all five countries we visited: Hungary, Croatia, Serbia, Bulgaria and Romania, the countryside is quite alike: low rolling hills filled with agriculture, mainly sunflowers and corn. Sunflower is grown for the sunflower oil and the corn for animal feed mainly. The tour guides spoke about the Carpathian and Balkan Mountains being about 1,000 meters (3,000 feet) high. (Fair Play is at 2,300 feet and we aren't even into the Sierras yet.). They talked about their liberation from the communists and how a lot of places have buildings that remain from the freedom struggles twenty yeas ago, including bullet holes in the walls, blown out windows and missing walls. I'm convinced the people want the western tourist to see what kind of struggle they had and we'll feel sorry for them, then come back home and scream they need help. 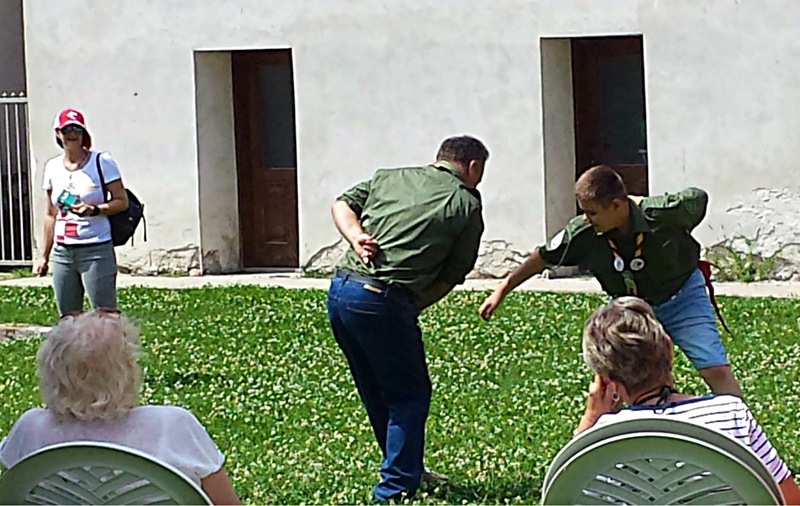 In Osijek, Croatia the "Highlight" was watching and Eagle Scout earn a patch by demonstrating an ancient game of "Grab the Flag." Three days (one day we stayed on the ship) out of five we had to travel by bus 1 1/2 hours one way and spend 2 hours (maybe) at the site to visit and then the return trip. I don't think the people who planned the excursions did their job very well, or there just isn't any place to visit right along the river. 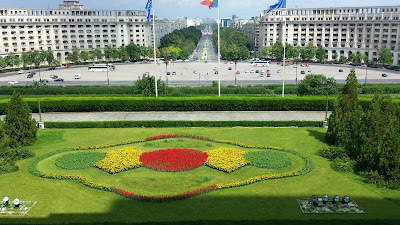 Even to visit Belgrade and Bucharest we had to travel by bus for a couple hours. Each bus trip had a tour guide who provided local history and explained what little there was to see along the way, mostly lots of agricultural stuff. The first two trips our tour guide ladies did a great great job. 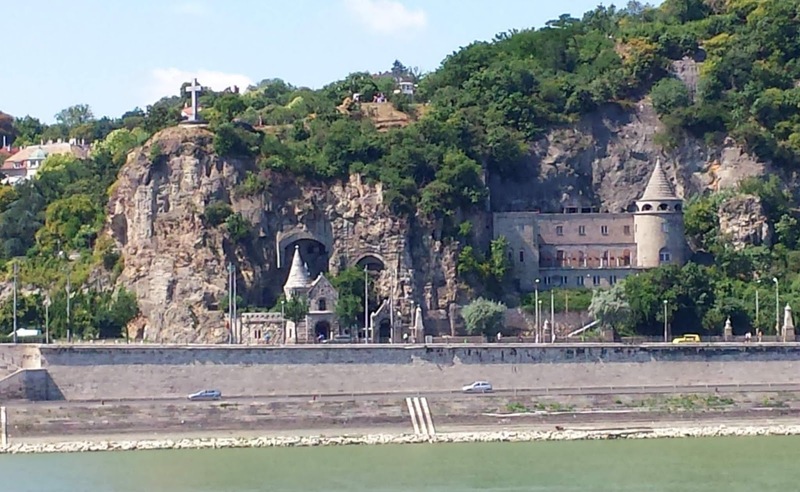 The river cruise highlight was the Iron Gate Gorge. The only way you can see this is on the river. 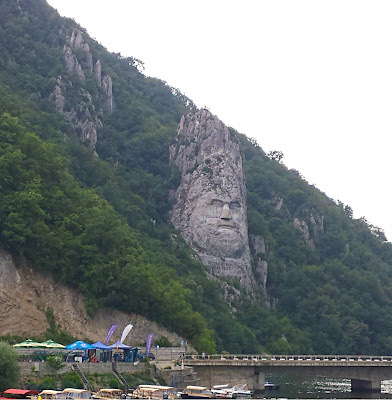 Decebalas, the last King of Dacia during the 100's (later became known as Romania), defied the Romans for many years. Rather than succumb he killed himself in the gorge. Between 1994 and 2004 this carving was done to honor him. The cruise line, which we traveled on in 2016 on the Rhine, was once again a real gem of an experience. Every single crew member was a perfect host, no matter what their duties were. They were friendly, very respectful and accommodating for any and all whims we had. I had my Ballantine Whiskey resupplied almost before I emptied the last short bottle. Cindy's Vermentino wine was replaced just as fast. We also got a little art work, Ralph waiting for us on our living room table after a day's outing. 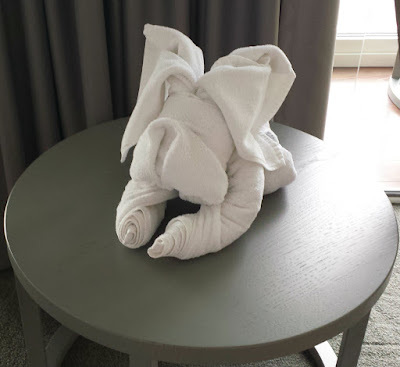 All in all the cruise was very enjoyable, relaxing and informative. There were some things that should have been made more clear before we booked the cruise--the number of days and hours on buses just to get to our appointed tourist visit and the number of steps at the different places (I didn't do two places because the cruise director said there were hundreds of steps involved.). The pride of the countries and the struggles for independence is admired, I understand that pride. I'm proud to be an American. What I don't understand is the lack of caring for even rose gardens in major parks and the parks themselves. It appears the communist influence of "that is your job and that is the only thing you do" has prevailed. The unkempt appearance that is rampant everywhere is very disheartening. I can say that the three big cities we visited are beautiful, the rest I have to describe as 2 1/2 world, not quite third world. My next trip to Eastern Europe will be to Budapest and then north. Once is enough for the other parts of our trip.